These “tricks” are geared to help your student get a broad framework of world history anchored in their minds and stay there. Great for moms too! An example of a trick is learning the dates for the Middle Ages. This period can be easily remembered once you see that the Middle Ages extend from the middle of the first millenium AD (500) to the middle of the next millennium (1500). From the middle to the middle–get it? That’s why it’s called the Middle Ages (not really, of course. The name comes from being sandwiched in-between ancient and modern history). So the Middle Ages run basically from 500 AD to 1500 AD. These tricks will provide a set of anchors for a basic overall framework of western world history and especially for the Bible. There are 15 tricks in all. Each is a stand alone item so you can easily pick and choose what is relevant to your child’s studies and discard what you don’t need. The images and some of the references go along with The ShorterWord Timeline of Western Civilization, but you don’t have to have the Timeline to use the Tricks, though they do relate and enhance each other. 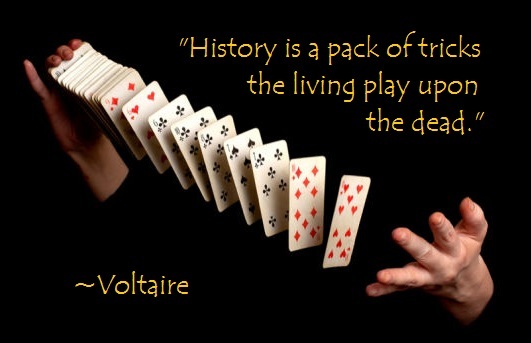 No doubt, Voltaire had entirely different “tricks” in mind when he used the term in the quote above. The past, as he might have explained, is what actually happened, but history is what historians tell us happened, and of course, no historian (and that includes you and me) is ever completely unbiased. But history is fun and the exploration and interpretation of history will go forever onward, including the good and the bad, the correct and incorrect. There will always be new theories being put forth about old documents, new archaeological discoveries clearing away old misconceptions (or giving us a few new ones! ), and fresh understandings as our ever advancing technology re-examines the past. So here’s to the study of history and to enjoying it–even if we do end up playing a few “tricks on the dead”! After the PDF file loads, just right click and hit “save as” to save it to your computer.